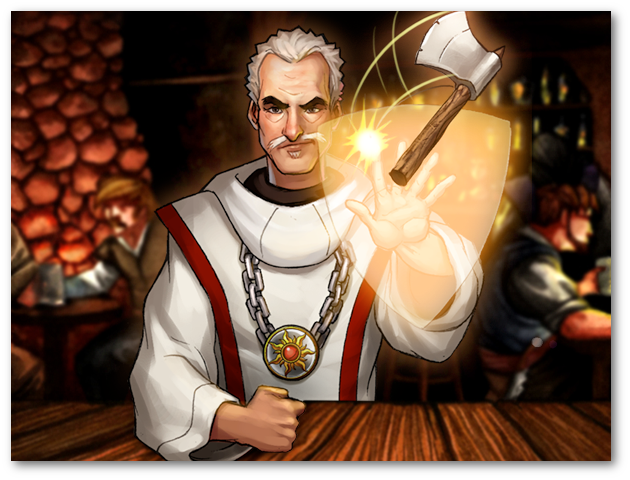 SlugFest games is proud to announce our second Red Dragon Inn: Allies character for 2014: Brother Bastian. Brother Bastian is a priest of Korash, the same god the orc paladin Serena worships. Korash approves of his followers making sacrifices for the greater good. Just like how Serena must sacrifice Gold and Fortitude to stay on the righteous path when she starts getting a little too orcish, Bastian makes his own sacrifices. Many of Bastian’s cards have dual effects: a more powerful effect typical of characters at the Inn, and a weaker effect that will earn him Prayer Tokens. What does Bastian do with those Prayer Tokens? Glad you asked! 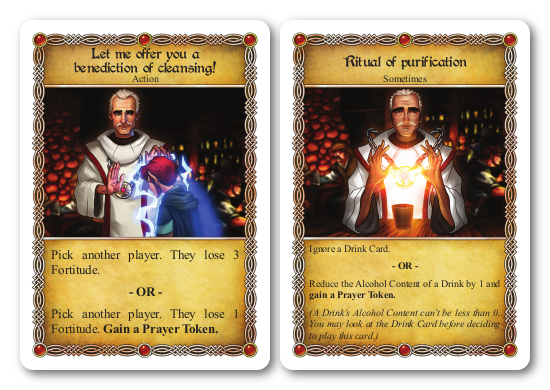 At the start of the game, Brother Bastian is given three random Prayer Cards. These Prayer cards are extra Action, Sometimes, and Anytime cards that can have a huge impact on the game. Some of them heal Bastian, others let him exercise his zealous fervor on ne’er-do-wells, and still others will have even stranger effects. 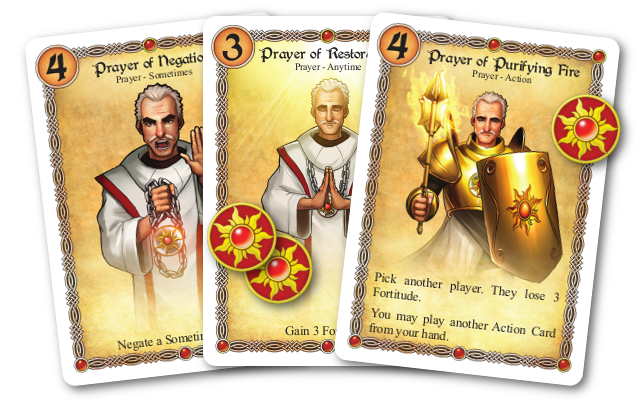 However, each Prayer Card costs a certain number of Prayer Tokens to play, so Bastian will need to carefully manage how he plays so he can maximize their usefulness. The best part about playing Brother Bastian is that the three Prayer Cards you are dealt at the start of the game are kept secret until you use them! This makes Brother Bastian one of the trickiest characters to play against. You may be attacking him on Fortitude all game, only to find out that he had been stockpiling Prayer Tokens for his Prayer of Restoration this whole time! We can’t wait to show Bastian off. You can expect to see him on our demo tables at Gen Con. For more information, and to find Bastian’s rules, check out his product page.